With global warming and adverse climate change becoming harsh realities today, world leaders are seeking ways and means to protect our planet from these ill effects of environmental pollution. 'Save Our Planet, Save Our People' has become THE mantra of 21st century. Alongwith the society, business organisations are also realising the need to do their bit in this endeavor. Out of choice or compulsion, many organisations are implementing Environmental Management Systems as per ISO14001:2015 standard, and subsequently seeking ISO14001:2015 certification. Apart from manufacturing companies, service organisations (both public and private) can also implement ISO14001:2015 and get certified. If you plan to implement ISO14001:2015 in your organisation, you need to impart company-wide training on ISO14001:2015 concepts and requirements. If your company is already certified to ISO14001:2015, there is still a need for imparting training to the new recruits. To understand the importance of environmental management. To learn the steps involved in the design, implementation and ISO14001:2015 certification of a company's Environmental Management System. What is ISO14001:2015, who issues ISO14001:2015 certificate, Gantt chart of a typical ISO14001:2015 implementation project, etc. 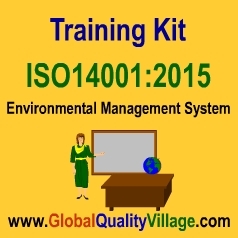 Note: As the older edition of the standard (ISO14001:2004) is still in force, we shall give the ISO14001:2004 EMS Training Kit FREE OF COST to the buyers of our ISO14001:2015 EMS Training Kit.